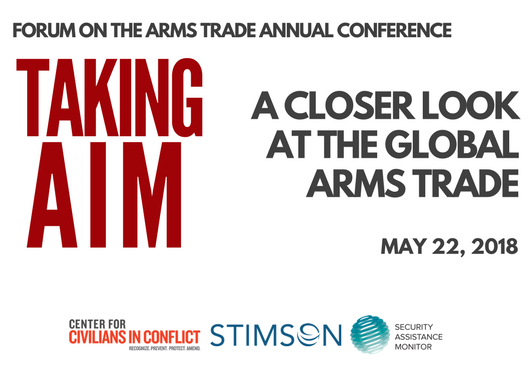 Senator Chris Murphy's keynote remarks begin at 1:00:55 in the video, during which he discussed a range of issues related to the arms trade, Yemen, and gun violence. Shannon N. Green, Senior Director of Programs, Center for Civilians in Conflict (CIVIC); former Senior Director for Global Engagement, National Security Council - see CIVIC/Stimson report"With Great Power: Modifying US Arms Sales to Reduce Civilian Harm"
​Colby Goodman (moderator), Director, Security Assistance Monitor - see the website and related database for multiple resources. ​The concluding conversation "War Dogs: Real Life Stories from the Arms Trade"(at 4:05:00 in the video) centered on Guy Lawson's book War Dogs (originally titled Arms and the Dudes: How Three Stoners from Miami Beach Became the Most Unlikely Gunrunners in History) and David Packouz's reflections on his time as an arms dealer during the events featured in the book and movie. Rachel Stohl moderated the discussion (see her work). Experts listed by the Forum on the Arms Trade will continue to be a resource on these and many issues. You can find out more about them here. If you are not already on the Forum's newsletter list, you may be added shortly. If you would rather not be included in those communications (approximately 3-4 emails per month), please feel free to email me directly to opt out.